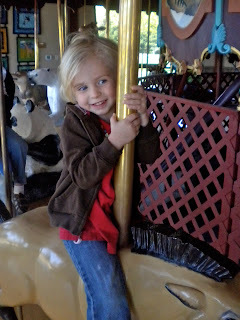 Last week we spent one morning at the Chattanooga Zoo. We had never been so we thought we'd give it a try. It is a small zoo and I don't think the kids were too excited about it. The carousel was by far their favorite part. As we were getting in the car to leave, Caroline said "Mommy, now can we go to the fun place?" Well, that was supposed to be our "fun place" for the day. And, I do think they had fun, I just think they expected a bigger zoo like the Nashville Zoo and this was not that big.